This golf season you can try all 3 municipal courses for only $99. Purchase your test drive at any municipal proshop, available for sale from April 1-30th. 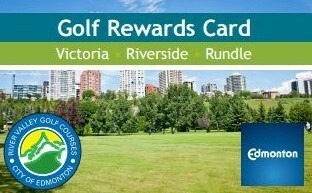 3-18 hole rounds of golf; 1 round at each course: Riverside, Victoria and Rundle. Valid Monday to Thursday anytime and Saturday, Sunday and Stat holidays after 3pm. Not valid for tournament play. Cannot be redeemed for 2-9 hole rounds. Spring Special - Receive 10% off green fees at Riverside and Victoria golf courses weekdays and golf 18-holes for $49 on weekends, now until April 30th. Whether you are a new or frequent golfer, these rewards and special deals are for you! Only $40 for 10% off on all things you love. Golf, Shop, Eat, Play, Repeat! Not applicable in conjunction with any other promotional offers, tournament play or multipass and subject to availability. Sign up now and drop off at the Riverside, Rundle or Victoria Proshop and start saving today. Only $100 for great discounts on all things you love. Golf, Shop, Eat, Play, Repeat! Not applicable in conjunction with any other promotional offers, regular tournament play or Multi Pass and subject to availability. Youth play free on Saturdays and Sundays after 2pm with the purchase of an adult green fee at Rundle Park Golf Course. *9-hole tee times available after 3pm. **This offer is limited to 1 child (aged 6-17 years) per adult green fee. 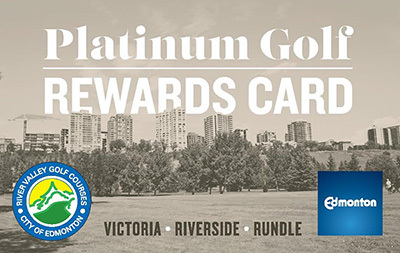 Save 15% when you purchase 50 or more rounds at Victoria and Riverside Golf Courses. It's a great way to recognize your volunteers or staff. These bulk admission passes are transferrable. For more information, see Bulk Admission Discounts. Depending on course conditions and season opening dates, discounts on green fees may apply during April and October. Contact the pro shop for more details at 780-496-4710.